Our Black Moonset T-shirt takes our iconic logo and puts it into a romantic setting of the moon setting over the ocean. 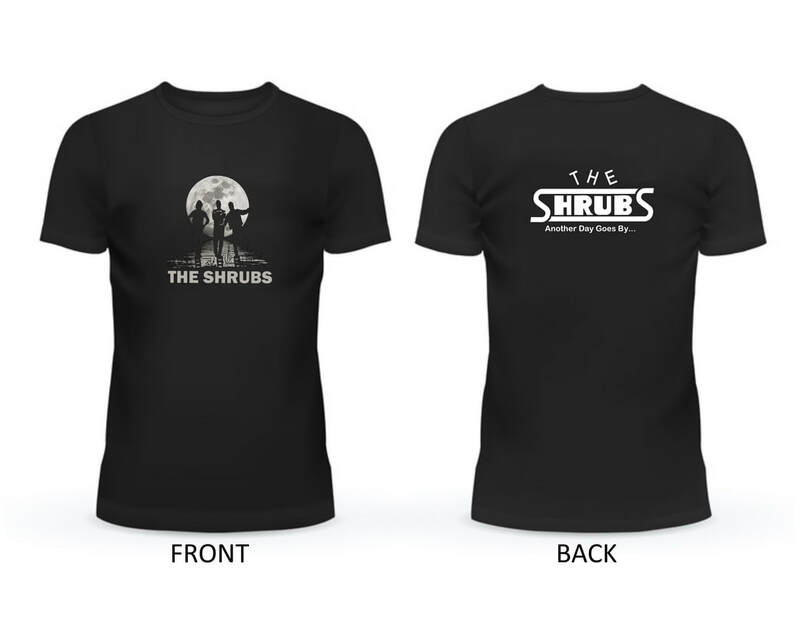 Get this for you and your favorite squeeze then enjoy the serenity while listening to your favorite band, The Shrubs. Due to its black color and absorbency, it's also great for cleaning up spills in the kitchen and makes a great X-mas gift too! Available in sizes, Small, Medium, Large and XL. True to fit and won't shrink (too much). ​Made of the finest cotton material fabric stuff. Available ​here on our eBay store. Our White Retro T-shirt is perfect for those edgy hipsters that want to rave all night. Put it on and blast The Shrubs (music). Dance until your feet hurt. Or don't. This shirt was not tested on animals and is washable. Makes a great X-mas gift too! ​​Available in sizes, Small, Medium, Large and XL. True to fit and won't shrink (too much). Made of the finest cotton material fabric stuff. Available here on our eBay store.